Gain deep insight into how your team is performing in key areas. Advance work in progress with ease and confidence. 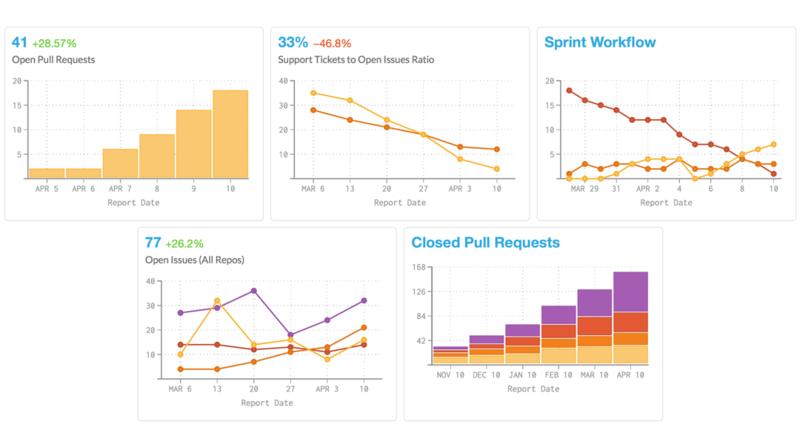 Pivotal Tracker allows you to limit distractions by making sure your team is doing the right amount of work. It also helps you understand the value of each sprint by measuring and comparing what’s been delivered. Use this integration to access dozens of performance metrics and consolidate a view across your projects. Cycle Time by Story Type enables you to improve your estimations by tracking changes from one sprint to next. Iteration Flow lets you identify blockers in your development process by visualizing your ticket flow. Backlog Burn Rate gives you the ability to update your roadmap faster than your engineering team’s output.